All the benefits of our very popular Grain Free Gourmet range, but with lower fat content, and a formulated blend of ingredients designed to help overweight and ageing dogs. What’s not to love? Fresh Trout & Salmon provide all the vitamins and minerals required to bring the best out in our dogs. High fresh meat content, Grain-Free and full of healthy vegetables. 10 out of 10 for taste. We don’t think you’ll find a more palatable light food. Full of really good things. Amino acids, Vitamins and Minerals. And a joint pack to aid bones/joints. Watch their skin and coat shine and dazzle like never before. Only 8% fat content – perfect for overweight dogs. It can be difficult to create a low fat dog food that still packs a flavour punch, but this certainly does the trick. Fish is an excellent source of low fat protein and the combination of fresh Salmon and Trout really appeals to even the fussiest pooches. 50% Salmon & Trout, flavoursome Asparagus, and healthy Sweet Potato makes this a taste experience for every dog. The high Omega 3 content helps maintain cognitive function, visual development, and reduce inflammation. Added L-Carnitine helps maintain a healthy weightand promote lean muscle development. It also has a specialised joint pack added to help preserve bone and joint condition in older dogs. Because it’s both grain free and hypoallergenic your dog will thrive without the worry of bad reactions, sensitivities or runny stools. It’s no secret that Salmon & Trout are great at attracting the attentions of most dogs. But with 50% Salmon & Trout the taste factor is is even more noticeable. Have a fussy dog? That wont be a problem here! We don’t use anything artificial in our foods – only the finest locally sourced ingredients that are sure to give our dogs a truly healthy balanced diet. Optimum levels of Omega 3 & 6 fish oils transform their coat. Added omega 3 supplement helps support visual development, cognitive function and reduces inflammation response. Sweet Potato is rich in Vitamin B and every ingredient in this food is there for a calculated reason. No added flavourings or preservatives. A human quality protein source that dogs will go out of their way for. Dogs love the taste of oily fish. And this food has more of it that normal dog foods. Who likes cleaning up after their dog? I don’t. 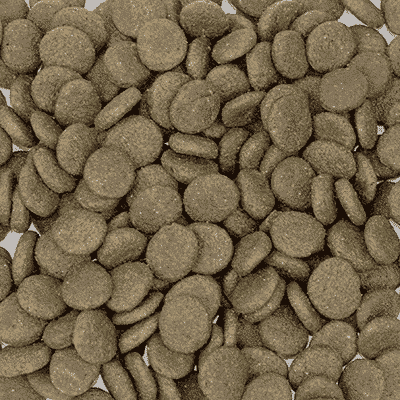 As we use highly digestible quality ingredients the food is easily digested. 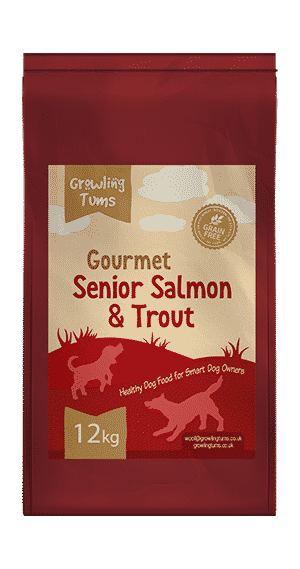 Ingredients: Freshly Prepared Trout (30%), Sweet Potato (24%), Dried Salmon (11%), Potato, Peas, Sugar Beet Pulp, Freshly Prepared Salmon (4%), Pea Protein, Whole Linseed, Salmon Oil (3%), Potato Protein, Salmon Gravy (2%), Vitamins & Minerals, Vegetable Gravy (2%), Asparagus (equivalent to 7.5g per Kg of product), Glucosamine (170 mg/kg), Methylsulfonylmethane (170 mg/kg), Chondroitin Sulphate (125 mg/kg), FOS (92 mg/kg), MOS (23 mg/kg). Analysis: Crude Protein 27%, Crude Oils and Fats 8 %, Crude Fibres 7%, Crude Ash 7.8%. This food is good. And he has not had a upset tummy since he has been on this food. I have problems finding sensitive dog food with no chicken. Like a lot of dog chicken upset my dog tummy. I was hopeing he would lose some weight but he hasn’t yet. He is a rescue Border Collie we have had him 4years we did find food with out chicken to start with but they changed the recipe and put chicken in it. I have been having trouble since finding a food that is light and no chicken. I was pleased when I found Growing tums. Even more pleased to find he like it and It suits him. Well done growing tums. My rough collie Elvis is really enjoying this food and he is really fussy. I love that it is only 8% fat. He was on a much more expensive purina pro plan obesity management food recommended by the vet but he only lost 1kg in a year. Also the food had more wheat than anything else in it. So chuffed I came across this web site. I know he is going to thrive on this food which is important as he is 10 years old with arthritis and there is also a joint supplement added. Thanks Growling Tums. My lab/retriever has been on samon/ trout light for a month, was 38.75 today weighed in at 37.50 so please we are getting to his goal weight and he loves his new flavour. Another bag to be ordered.